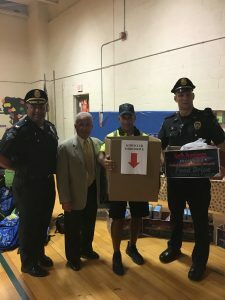 Mayor Charles Lombardi, Colonel David Tikoian, SRO Kevin Guindon, and Sgt. Chris Puleo standing with the Kids Klub donation boxes from the lobby of NPPD HQ to benefit NP families. Thanks Kids Klub and everyone that donated to this worthy cause.